► The audio system automatically switches to the AUX mode. To switch the mode, press any of the audio mode buttons. You can return to the AUX mode by pressing the AUX button. 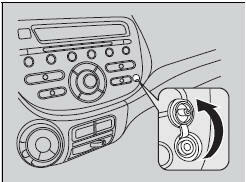 You cannot use the auxiliary input jack if you replace the audio system.